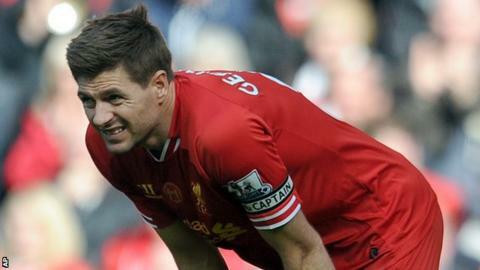 Captain Steven Gerrard believes runners-up Liverpool will win the Premier League title before he retires. The Reds challenged until the final day of this season but, despite a 2-1 win over Newcastle, finished two points behind champions Manchester City. "This experience is going to take us to the title," Gerrard, 33, told LFC TV. "Whether it is next year or the year after, it will happen pretty soon. "I've only got a couple of years left but I still believe I can get there." Gerrard has captained Liverpool to success in the Champions League, FA Cup and League Cup, but the Premier League remains beyond his grasp. "I thought my days of title races had gone but, having played with this group of players this year, the dream is back," he said. "I never give up fighting. I'm really confident and believe the title is not too far away. "We've proved this season that we're capable of mixing it with the best, and we want to go one better next year." Liverpool, who had not finished higher than sixth in their previous four seasons, started the final day trailing City by two points with a far inferior goal difference, meaning they needed to beat Newcastle and hope the leaders lost at home to the Hammers. But City's 2-0 victory rendered Liverpool's defeat of Newcastle academic in terms of the title, although the three points ensured they finished second ahead of Chelsea. "If someone had said to me that we would go into the last game with a slim chance of winning the league, I'd have taken that at the start of the season," said Gerrard. "But as a footballer you always want more. "We have been unlucky. We gave it a great shot, but we fell a little bit short." Former Liverpool captain Alan Hansen, who lifted the club's last top-flight title in 1990, said the season must be regarded as a failure given that the Reds had the title in their own hands with four games remaining. Hansen told Match of the Day: "It's a failure, an absolute failure. You get into that position with four games to go, if you had gone into that dressing room today they would not have been celebrating anything. I think it will be massive disappointment. "If you are at the start of the season, Liverpool would have bitten your hand off to finish second and be in the Champions League, but with the title in your own hands, it's failure." Gerrard, who will captain England at the World Cup in Brazil this summer, wants the Reds to improve their squad in the summer. "If we add to this team and squad in the right areas, we are capable of challenging," he added. "Things have changed here - the supporters know that and the players know that." A 3-2 victory over Manchester City in April put Liverpool in control of the title race but a 2-0 defeat by Chelsea and 3-3 draw at Crystal Palace handed the initiative back to Manuel Pellegrini's men. Manager Brendan Rodgers rejected the notion Liverpool choked in the home straight, and preferred to praise an "incredible achievement." "I don't think anyone can say we failed to cope with the pressure," he said. "In the last 14 games of the season we won 12, and drew one so the players have shown an incredible consistency and quality to finish second behind Man City. "It's been wonderful to see the supporters, and the power of the club and the institution that is Liverpool. We made them dream and that is our job. "The great thing is that we will improve. We will get better next season and we will be ready to fight again. But now we have the belief." Liverpool's dream dies - but is another set to be born?